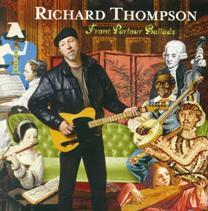 George Graham Reviews Richard Thompson's "Front Parlour Ballads"
The English folk scene that emerged in the late 1960s has proven to be remarkably durable, with many of the performers who were part of the pioneering groups, the Pentangle, Steeleye Span and Fairport Convention, still remaining active, and the groups still occasionally getting back together. Fairport marks its 38th anniversary together this year, and they still remain a viable force in music touring frequently, holding an annual festival and releasing a steady stream of new recordings. One of the founders of Fairport Convention is Richard Thompson, who though he left the group around 1970, remains forever associated with it. However, more than one generation of music fans also know him as a distinctive, articulate and wide-ranging solo singer-songwriter, and an influential guitarist, who is cited by Dire Straits' Mark Knopfler was one of his main influences. Since he left Fairport, Thompson has been doing a diverse series of recordings, with his reputation cemented by a memorable musical association with his then-wife Linda Thompson in the late 1970s. His solo albums have run the gamut from rock oriented to introspective. He has usually collaborated with a band or at least another instrumentalist, such the unrelated bassist Danny Thompson. Richard Thompson has also made an occasional cameo appearance with Fairport Convention and he recently attracted attention with his series of performances called "1000 Years of Popular Music" in which he really does span that wide a range of music. Richard Thompson's newest solo release, is almost literally that, a recording with practically all the instrumentation played by Thompson himself in a home studio, with just some occasional help from a percussionist. It's called, appropriately, Front Parlour Ballads. Thompson was one of the rare English folk performers who managed to stay on a major record label through much of the 1990s, but when that ended, Thompson self released some concert recordings, a DVD, and an instrumental recording through his website. Front Parlour Ballads does have a record label behind it, albeit an independent company which has released several CDs some of the people from the English folk scene. As mentioned, Thompson recorded this CD in his own studio, located over a garage at his Southern California home. The result is an outstanding release with 13 more Thompson gems, many in his classic style, with lyrics full of the ironic twists for which he is known, with some fine, but subtle guitar work. As a long-time Thompson fan, I also found the intimate solo setting particularly effective for his songs. Thompson's sole accompanist is percussionist Debra Dobkin, who worked with Thompson on his "1000 Years of Popular Music" tour, and had also performed with Bonnie Raitt. Most of the songs on this CD have to do with relationships that are in various states of disarray including two apology songs. Of course, there are a couple of pieces that cover other territory, including one about the slaves in the galley of a ship. Critics have long been fond of saying that Richard Thompson is one of the best "unknown" performers and songwriters in music, or that he deserves wider recognition. Given the state of the major label record business and the commercial media, it's doubtful that this highly influential, nearly 40-year performer will ever become a pop superstar. But he has cultivated a devoted audience over the years, and most of them, especially those who enjoy Thompson live are going to celebrate the arrival of Front Parlour Ballads. It's a great collection of songs, and the intimate setting allows the listener to focus on the writing, but the CD still provides some nice instrumental work, with Thompson demonstrating his versatility with performances on mandolin and accordion, plus some worthy guitar solos here and there. Our sonic grade is an "A." Thompson is quoted as saying that he did not want a "glossy hi-fi production," but ironically, the fidelity of the recording is impressive, with Thompson and his engineer associate on the CD Simon Tassano, achieving outstanding sound exactly by not doing a lot, making for a pleasingly intimate and immediate-sounding recording. The dynamic range is also rather respectable. There are a lot of performers in the rock world who seem to have just a few songs in them, and despite a long career, they basically repeat the same ideas. Richard Thompson is remarkable not only in the length of his career, but his abilities to create fascinating new music and take the risk of making an album with such a scaled-back, intimate musical setting, and have it be so wildly successful musically. And perhaps it might even expand Thompson's audience a little more.